Is there a curriculum that you loved in the beginning that you’re just not enjoying anymore? Have you ever contemplated quitting a curriculum outright? I have. Oh I have! I’ve told myself that I shouldn’t give up. I’ve thought of the time and money I’ve invested into a program. But I’ve finally concluded that it would be best if I quit my curriculum. Yes, I’m quitting my language arts curriculum – The Phonics Road. Before I tell you the entire sob story, let me ask you: Do you need to reevaluate your curriculum? Is there something that you need to quit? Or are you not sure? Well don’t worry! I’ve got you covered! I created a Curriculum Assessment and Scoring Guide. You can work through each of the programs you are currently using and score how well they are working for you. It’s an amazing tool to help you determine if you should continue or quit your curriculum. Grab your assessment right here! Curriculum break ups are really hard! Is it me? Is it the program? What’s not working? Read my story of a curriculum breakup. It is hard! But I know it is necessary for me! Everything is included in this program. It covers reading, writing, spelling, and literature with a strong phonics focus. The phonics rules are clearly explained and practiced thoroughly in each of the spelling lessons. Through watching the DVD’s, you learn quite a bit about phonics, grammar, and literature yourself. It’s a great way to brush up on all the things you’ve forgotten (or maybe didn’t ever learn) in from elementary school. Many of the grammar lessons include sentences taken from the literature selections. The program builds on itself and the grammar is taught in context with lots of practice marking and analyzing sentences. Using both dictation and copywork has been amazing in our homeschool. I’ve seen the benefits of this method and I love that the program incorporates both into the lessons. The program moves a student through a study of English grammar and toward the study of Latin grammar. It also introduces words roots with explanations of the meaning of each. It doubles as a vocabulary program! I’ve used Phonics Road up through Level 3. I currently have a child finishing up Level 3, one in Level 2, and one in Level 1. Despite the benefits that I’ve seen with using the program, I’ve decided that once my children complete Level 3, I won’t be continuing with Phonics Road or the Latin Road. My main reason is time. I don’t have time to continue with this program, because it is extremely time-intensive. Watching the DVD’s and preparing to teach the lessons is very cumbersome. It left me wishing the program were more open-and-go with a scripted teacher’s manual. If I taught the program as written, I would spend over an hour just on our daily Phonics Road lessons. I realize that this is reasonable given that the program covers all of language arts, but I don’t want to spend so much of my time on one curriculum. The program is also very parent-intensive. There are very few aspects of the program that can be done independently by the child. Through my homeschooling experience I’ve learned that I prefer a more eclectic approach. I don’t want all of my language arts experience to come from only one program. I like to pick and choose my curricula from a variety of publishers. Also, I have a child who is a strong reader but a weak speller, and a child who loves to write but is not as strong in grammar concepts. Therefore, they need different programs for each aspect of language arts to teach to their strengths and to support the areas in which they are weak. An all-in-one approach is not really working for us. I can’t believe I’m saying this aloud, but I feel like parts of the program are just busy work. There is a massive amount of writing required for each of the levels and I feel like more could be accomplished with less writing – doing parts of it orally or on a whiteboard or with me doing the writing. I also feel like some of the grammar assignments, and especially the literature assignments, could be streamlined or even eliminated. I don’t feel that all of them are necessary – the same concepts could be taught in a way that is more efficient. This program is designed for a 5 day a week homeschool structure. While we often do 5 days of school, the 5th day is usually filled with more extras or with field trips. I feel like the program didn’t give us very much flexibility. It is challenging to adjust the program to fit into a 4 day school week and divide the work evenly to fit into our schedule. So, while the program has provided us with a wonderful foundation in phonics, grammar rules, and basic literary analysis, I don’t feel that continuing with the program is the best fit for our homeschool. I’m very ready to try some new things and explore other options. I’m still searching for what programs we will use instead, but I feel relieved that I’ve come to a decision about this program – even if it was hard to say goodbye to a program that I’ve been using for years. Are you wondering if you should quit any of your curriculum? Here’s a great video to help you determine if you should quit or keep going with that curriculum. Have you quit any program that you’ve used for several years? Did you find it challenging to come to that decision? If you’re looking at something on your shelves and considering quitting, know that sometimes it’s ok to part ways. After all, you’re not actually quitting – you’re just moving to something new! To read more about how I’ve used the Phonics Road, you can read my review of Level 3 or my thoughts on Level 1. If you’re unsure if you should continue with a curriculum or if it’s time to quit, be sure to download my free curriculum guide worksheet. 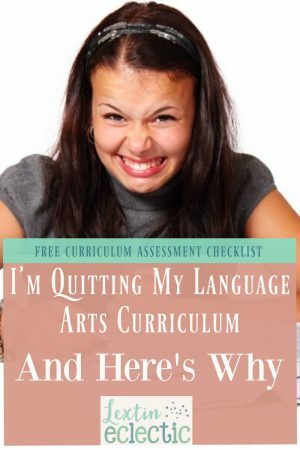 It will walk you through a short assessment with a scoring guide to see if you should quit or continue with a particular curriculum. I think you’ll find it helpful as you evaluate your homeschool year!